Always wanted to know how it would feel to be Link from The Legend of Zelda? 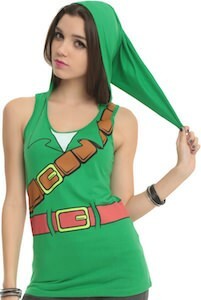 Females are in luck because now there is this special costume tank top that looks like the famous outfit that Link wears. The green tank top has a hood and all the details your expect from a costume shirt. Front and back of this women’s tank top have belts and other details to make it perfect for a day behind the game console or maybe even Halloween. Available in junior sizes XSmall – 2XL this shirt is just the perfect way to show the world that girls like video games to. Come and order your The Legend Of Zelda Link Hooded Tank Top. 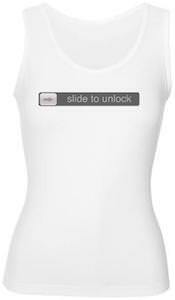 We all love our iPhone and iPod touches and we do love are female geeks to so why not give them something cool like this Slide to Unlock tanktop? I really like the way they make this look very plain an simple but still so adorable that I almost want one myself. And that is no problem either as they come in different style shirts to for women and men. Check out this Slide to unlock tanktop and the range of colors you can get it in.